With the possible exception of Magic: the Gathering, I generally tend to pursue dead CCG’s for their low cost and often innovative mechanics. Unfortunately, they do bring the problem of not having enough competitors. At my local game store, I’ve been pleased to see that my fellow Magic players have expanded out to other games. I’ve recently seen them playing Yu-Gi-Oh and Pokemon, and I think there may be an opportunity to start introducing them to the more “dead” games out there. I picked up a bunch of boxes of these for beans at my first Origins auction, and I haven’t have a chance to play them. I’m fascinated by the combination of gun-slinging and poker game mechanics; I might just have to make a few decks and play it like a regular tabletop game. This isn’t just from the playing backlog; it’s also from the production backlog. As I continue to develop the game, I’m realizing more and more the constraints of developing a game under someone else’ rule system. I have a lot of ideas for the game, but many of them make it incompatible with the original. If you couple that with the fact that there are so many good game mechanics out there now (see below), it’s hard to keep the game as simple as the original. I’ve tried to introduce a leveling system for the monsters in Age of Heroes, and I am yet to see a leveling system as good as the one introduced in MapleStory. In MapleStory, you level the characters rather than the monsters, but the overall progression mechanism is the same. 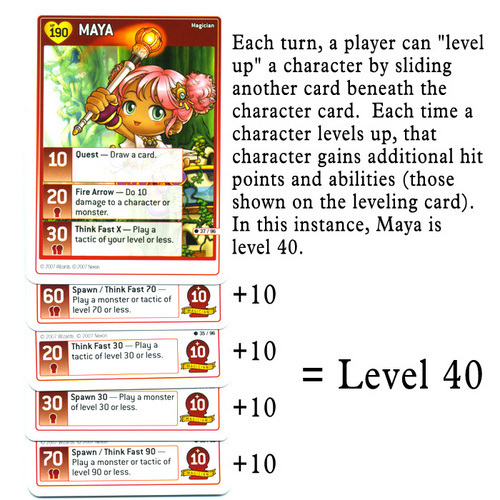 Every card that you can draw to you hand has an ability at the bottom, and can be used as a card extender to “level up” your character. The consequence of this is that some part of every card in your hand is useful, even when the full ability is not. This is not so much a game that I haven’t played as it is a game that I haven’t played enough. There is definitely a need for more games that put the players against the game rather than against each other. It’s hard to do, but it’s definitely worth it. Quick story: I fell into a funk last year when I first played Sentinels of the Multiverse. After finishing the demonstration of the game at PAX, I started to feel that there was no point to remaking Age of Heroes. SotM accomplished everything I wanted to accomplish with Age of Heroes, and much, much more. After coming out of it I realized that there’s a place for Age of Heroes, but I am going to have to rethink my approach to it. It’s possible that I will have to make two different games; one “kid friendly” version of Age of Heroes, and one that combines the elements of SotM and MapleStory to make a fuller experience. This game has quite possibly the most interesting and innovative game mechanic I’ve seen. Your cards are arranged back to back in 16-sleeve spell books. You do damage to your opponents book by forcing the opponent to flip pages, and the first player to “close the book” by flipping after the last page wins. I wrote a review about it on BoardGameGeek a few years ago, which can be found here. Had this game been given a more generic “mage war” type of theme, I think it would have been much better. 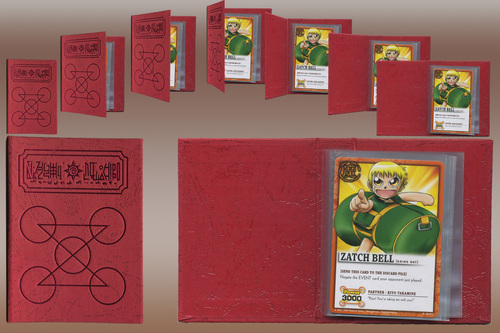 As it is, the dog-fighting-with-children theme of Zatch Bell may have been too much for people to handle. If you are interested in picking this one up, I just saw a set of 5 sealed booster boxes (series 1) for $20 with free shipping. The only thing you would still need to get is the spell books, which can generally be found for about $3 to $5 each.